MILAN — Lavazza returns to the Fuorisalone, choosing the radical spirit of Gufram for the most anxiously awaited international design event. An immersive installation devised by Gufram in which the theatricality of the setting contains the precious result of a collaboration as unprecedented as it is original. 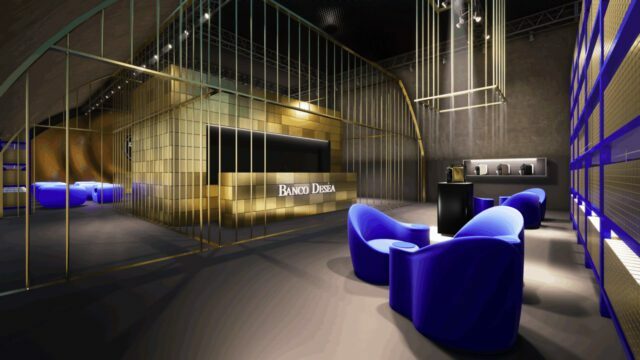 In the recently created Ventura Centrale district, “Banco Deséa” is an exclusive space with unexpected shapes inspired both by Lavazza’s iconic new Deséa Golden Touch coffee machine by Gufram, as well as by the Qualità Oro rebranding project. The Turin company’s storied blend returns to the homes of all coffee lovers with a more contemporary and avant-garde look, the result of an evolutionary design process that began in 1956 and has transformed it into an innovative, premium product while retaining its values of quality and tradition. Like precious objects to valorise and protect, Deséa Golden Touch by Gufram and Qualità Oro are the focus of an original theatrical setting that reproduces a bank caveau in one of the hangars in the Ventura Central district and is designed to amaze all visitors to Design Week from the moment they enter the space. The design of the new Limited Edition coffee machine by Gufram defines its surroundings by establishing a dialogue between object and environment, between the physical and the visual, transporting visitors into an immersive atmosphere tinged with shades of gold that highlights the uniqueness of Deséa Golden Touch by Gufram and the Qualità Oro restyling project. It’s a space designed by Guffram and characterised the brand’s unmistakably irreverent approach: novelties and icons in the collection welcome visitors right from the moment they enter the space, inviting them to embark on a highly evocative journey. As part of its collaboration with Lavazza, Gufram has carried on an in-depth research project into the Turin-based brand’s identity and legacy, reprising a design created 10 years ago by Setsu & Shinobu Ito and that has now finally been implemented and calibrated in terms of its materials and fabrics to become a real product. The result is Aroma, the club chair that suggests a space of comfort and well-being in which to enjoy a delicious cup of coffee or a drink in peace and quiet. The sleek, flowing contours of the backrest slope down harmoniously and asymmetrically to form the practical tablet arm: an intimate space that accompanies the taste experience with its curving lines. The New Bocca® Unlimited is the original lip-shaped sofa that celebrates its 50th anniversary in the lounge area at the 2019 Fuorisalone with a new look: an unprecedented new fabric that is more material and structured, available in 25 new colours. It is a new look that changes the known perspective of this design object, which more than any other represents the perfect abstraction of feminine beauty. This space devoted to relaxation and amusement is completed by Roxanne, a swiveling armchair with generous, flowing lines for the utmost comfort. This surprising space is both an original Coffee Club, where the experience and quality of the world class Turin-based coffee business meets the creativity of Gufram for a unique coffee experience combined with a surprising food offering and unexpected entertainment opportunities. The Lavazza Training Center will bring its unmistakable imprint to the special offering of coffee and food, featuring unusual and tasty recipes from breakfast to cocktail time. During the day, four special Mocha recipes will be prepared, inspired by the nuances of Deséa and the golden colours of Deséa Golden Touch by Gufram, while in the evening, accompanied by the avant-garde music selected by Apollo Milano, there will be a selection of the most creative Lavazza Coffeetails, including coffee Spritz and Coffeetail no. 50.